Burnishing in a controlled manner can have desirable effects on American Flyer model train track and (switches) turnouts. With all the talk of track cleaning, the advantages burnishing gives me far superior performance. The results are dramatic with very little gunk accumulating on the model train track and better conductivity thru out my American Flyer Cabinet-top train layout. Yes, you have to burnish the track before you lay the track on your layout. It’s been going on four years without any track layout problems. As they say: Its was the operators error! In that case it was. I have used the burnishing processes in orthopedic field of manufacturing to improve surface finish, or surface hardness metal. 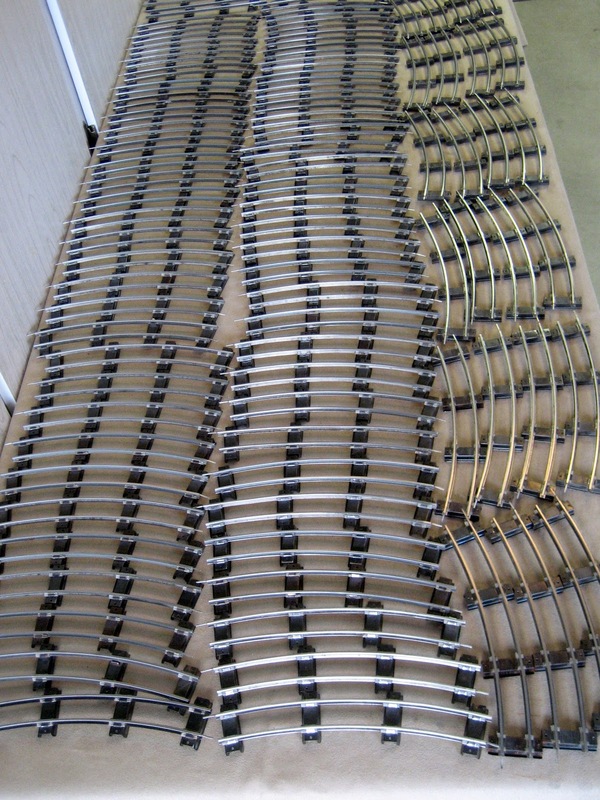 The benefits of burnishing include: prevents corrosion, eliminate visual defects, closes porosity, creates surface compressive residual stress and superior conductivity when it comes to metal train track. I have added the YouTube video "How I Burnish American Flyer Train Track" to this page. I have been asked on a lot a different forums how this burnishing wheel works with three (3) rail track. I will not talk about the make of track, because I just work with and on American Flyer......and I have friends that collect everything from G, O, S, HO, N etc. I will just till you what worked for me in burnishing the three rail track, and what did not work for me or I had a problem with. From the Top is the Ugly Track, that is in very rusted condition. The Middle is the Bad Track, that is in poor condition and less rusted. The Bottom is the Good Track, that is in good condition with very little rust. I went ahead and burnished all three sections of track (the good, bad, ugly. I only burnished the left side of each section of track, but all three rails. The burnishing of the rails was not the problem in any three sections. The problem that I found was I could not get between the rails of the O gauge track being narrower then S gauge. This was because of three rails rather then two rails. The next problem I found was because this is O gauge, the rails are higher compared to S gauge track and I could not get far enough underneath the rails. After taking these photos, I got the idea of getting out my hand held 10.8v Dremel with the small wire brush attachment. This cleaned up all the rust and corrosion under neath the rail that I could not get at with the burnishing wheel. The good track I did not wire brush the sides of the rails, because I like the looks of it. The bad track I did wire brush under the rails and they came out just like new. The ugly track I also wire brushed under the rails. To my surprise they came out looking more weathered. I myself would just seal the sides of the rail with a clear paint spray and re-burnish the tops of the rail to get any over spray off. The track was still very much usable. The burnishing wheel doing its job on tops and sides of the rails, and the Dremel wire brush doing its job under the sides of the rails. In all I think we found the right combination for all track cleaning and burnishing no matter two or three rails. Up Date 11/19/2014 There has been a lot of interest in this type of wheel I'm using to burnish model train track. I myself, have more train track than I can do, just by word of mouth. So I'm passing this information on to any model train club that would like to take on this service as a club project. If you need any further information you can contact myself via this Blog Page.